We are deeply concerned to hear of Japan’s decision. Japan have announced that they will withdraw from the International Whaling Commission (IWC) and resume commercial whaling. The country’s fleet will resume commercial operations in July 2019. This could result in many species of whales becoming under threat. 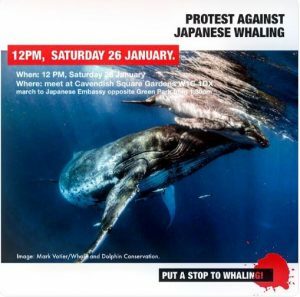 Join the march in Cavendish Square London at 12 noon on 26 January to march at 1pm through London to the Japanese Embassy. Bring placards, whistles, drums, inflatable whales and let’s makes some noise. 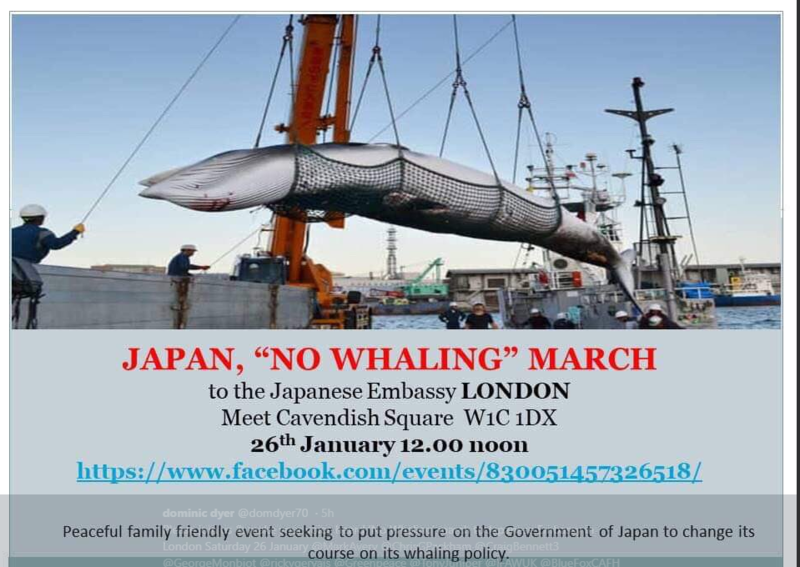 The march will be a peaceful family friendly event, which respects the Japanese people and nation, but seeks to put more public, media and political pressure on the Government of Japan to change course on its whaling policy. Conservationists consider all species of large whales to be living under unstable conditions. They’re facing new environmental challenges. Whales are threatened not just by hunters, but also by climate change, pollution and toxic runoff and ships that strike them. Campaigning MEP John Flack is set this weekend to go on his first protest march – at the age of 62. 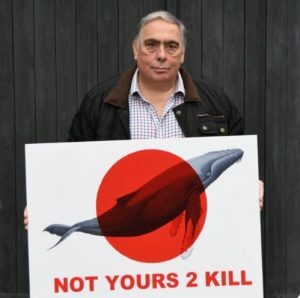 The Conservative politician, a passionate supporter of animal welfare and conservation, will join a family-friendly march through central London to protest against Japan’s decision to resume commercial whaling, in defiance of a long-standing international ban. He will address the marchers on Saturday January 26, at 12 noon in Cavendish Square before they set off for the Japanese Embassy. Mr Flack, MEP for the East of England, is vice president of the European Parliament’s cross-party Intergroup on Animal Welfare and a member of the Parliaments Delegation for relations with Japan. He plans to raise Japan’s decision at its next meeting. He also serves on the Fisheries committee. He said: “I have never marched before but there is a first time for everything – and this despicable action by the Japanese government has left me furious. “Whaling is cruel, barbaric, and devastating to these threatened species. “Thanks to the ban, populations of some of the most endangered whales are just beginning to recover from the wholesale slaughter that nearly wiped them out. “This decision threatens to turn back the clock and undo all that good work – all because of human greed. RICKY Gervais, Joanna Lumley and Ben Fogle today joined a raft of politicians and environmentalists to demand Japan reverses its decision to back commercial whaling. In an open letter to Japanese Prime Minister Shinzō Abe, a host of stars blasted Tokyo’s decision to leave the International Whaling Commission and return to whaling in its territorial waters. In December last year Japan announced that it is to resume commercial whaling from July. The letter, signed by UN Patron of the Wilderness Ben Fogle, naturalist Chris Packham CBE, comedian Ricky Gervais, primatologist Dame Jane Goodall, actress Joanna Lumley OBE, broadcaster Stephen Fry, and environmentalist Captain Paul Watson condemns the Japanese Government for undermining international efforts to protect endangered whales. Whale numbers are beginning to recover after decades of catastrophic decline as a result of commercial whaling. Japan has killed some 8,201 minke whales in the Antarctic since 1986. Branding whaling a cruel and archaic practice, the signatories of the letter give their support to a protest march taking place in London at midday on 26 January. The protest outside the Japanese Embassy is being organised by the London Committee for the Abolition of Whaling. Speakers at the event will include broadcaster Stanley Johnson, President of the Born Free Foundation Will Travers and John Flack MEP. Naturalist Chris Packham said: “To the utter disgust of the rest of the world Japan intends to resume killing whales. “We don’t need statements of disgust, we need sanctions that will hurt. If shame won’t turn the Japanese then economic pain might. The open letter to the Japanese Prime Minister is signed by Chris Packham CBE, Ricky Gervais, Captain Paul Watson, Jane Goodall, Steve Backshall, Liz Bonnin, Zac Goldsmith MP, Ric O’Barry, Stephen Fry, Virginia McKenna OBE, Will Travers OBE, Selina Scott, Joanna Lumley OBE, Nicky Campbell OBE, and Chris Butler-Stroud. It was published in the Daily Telegraph on January 24, 2019. Speakers will include: Stanley Johnson writer and broadcaster, Will Travers MBE President Born Free, Carrie Symonds Ocean conservation campaigner, John Flack MEP, Bella Lack Born Free Youth Ambassador, Lorraine Platt, Co-founder Conservative Animal Welfare Foundation, Dominic Dyer wildlife campaigner and writer, and Peter Hall philanthropist and environment campaigner.